Individuals with sensitive skin are vulnerable to allergic reactions and breakouts. It can be caused by both environmental and genetic factor. Other causes that can lead to this skin condition include exposure to excessive heat or cold, stress, and certain underlying skin conditions like eczema, rosacea, urticaria, and allergic contact dermatitis. If your skin has low tolerance for certain things like detergents, cosmetics, environmental changes like too much heat or too much cold, and sunlight, it means that you have sensitive skin. 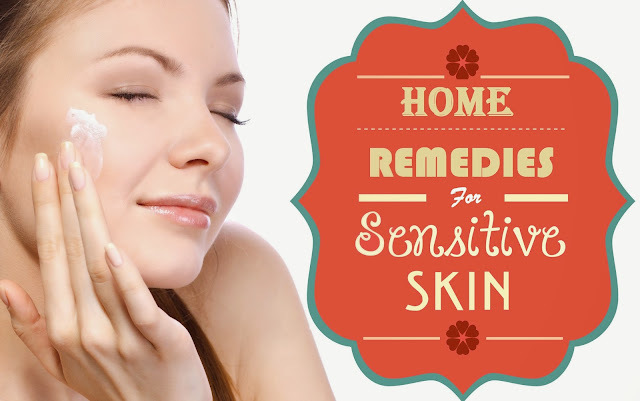 Fortunately, there are some home remedies for sensitive skin. People with sensitive type skin are recommended to use mild soaps and liquid cleansers that have low pH levels. Avoid using antibacterial soaps to wash your skin. Switch to a toner that does not contain any alcohol, petrochemicals, or fragrances. Also, use fragrance-free detergents to wash your clothes and linens. Choose hypoallergenic skincare products that do not include any fragrances, coloring agents, or alcohol. Remember that even essential oil fragrances and natural coloring agents can cause irritation for sensitive type skin. It is also better not to use hot water to shower or wash your face. Before going out, wear a sun block that has a SPF of at least 15. Drink plenty of water everyday. Diet is also one among the important home remedies. Make sure to eat a balanced diet that includes fresh vegetables and fruits. Rosewater can be used to tone and cleanse normal and oily sensitive skins. Evening primrose oil is also good for sensitive skin. You can take it both externally and internally. Both almond oil and jojoba oil are effective cleansers for this type of skin. Mix grapefruit juice and oatmeal together to make a paste and use it as a scrub to exfoliate your skin. If you have skin irritation from shaving, apply aloe vera gel to the affected area. It is also effective to cure skin rashes. Yogurt is one of the best home remedies for sensitive skin. Apply yogurt over your face, let it remain there for a few minutes, and then rinse it off. Mix one cup of yogurt with a half cup of oatmeal. Apply this mixture on your face for at least fifteen minutes and then wash it away. Honey can be used as a facial for sensitive skin. Warm some honey and rub it all over your face. Let the honey sit on your face for at least fifteen minutes. Wash your face with lukewarm water.